William Conor OBE RHA RUA ROI (1881-1968) was born in Belfast. Celebrated for his warm and sympathetic portrayals of working-class life in Ulster, William Conor studied at the Government School of Design in Belfast in the 1890’s. Born in the Old Lodge Road area of North Belfast, the son of a wrought-iron worker, his artistic talents were recognized at the early age of ten when a teacher of music, Louis Mantell, noticed the merit of his chalk drawings and arranged for him to attend the College of Art. 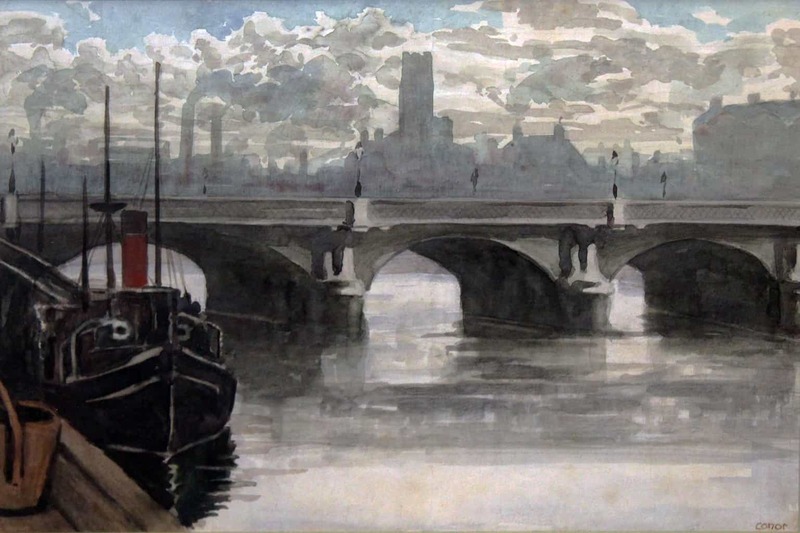 He initially worked as a commercial artist, before being commissioned during WWI by the British government to produce official records of soldiers and munitions workers. He moved to London in 1920 and there met and socialised with such artists as Sir John Lavery and Augustus John. He exhibited at the Royal Academy in 1921 and in Dublin at the Royal Hibernian Academy from 1918-1967, showing there nearly 200 works. Conor was one of the first Academicians when the Belfast Art Society became the Ulster Academy of Arts in 1930. He became an Associate RHA in 1938 and a full member in 1946. Exhibitions at the Victor Waddington Galleries were held in 1944 and 1948. In 1952 he was awarded the OBE and in 1957 he was elected President of the RUA, an office he held until 1964. More than 50 works of his in crayon and watercolour are in the permanent collections of the Ulster Museum.